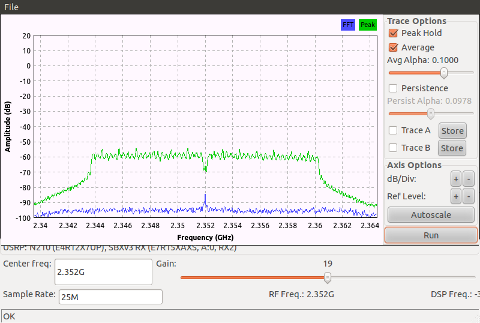 I was aware for long time that Atheros (bought by Qualcom in May 2011) wifi chips can work in the below 2.4Ghz band and lately I saw an old post from here confirming that but I had never tried this. Note: check your country’s legislation and your hamradio license to understand the conditions under you can do this. Having a connector for an external antenna makes room for a lot of experiments, including using of high gain point-to-point antennas. The AR9271 chip is using a kernel driver and a SoftMAC driver which is the software implementation of the MLME (MAC Layer Management Entity). However, other chips implement this sublayer into HW. 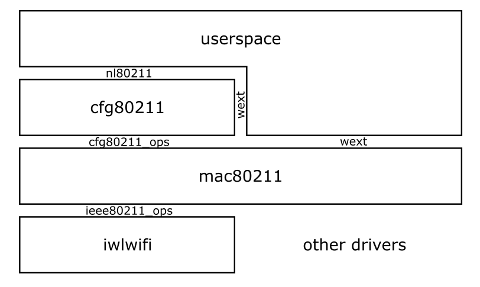 The wireless stack in Linux kernel is presented below and a good overview is presented here. This is because the channel is seen internally as unsigned number and it need to be transformed in a negative number so that the returned frequency will be the right one. The channels in 80211 are separated by 5Mhz and how the new ones are seen in user space is shown below. The regulatory database (regdb) is the Linux solution to achieve legal regulation for each country the machine is used in. It is basically a user space database that lists specifics like allowed bands, channels enabled, power levels, antenna gain, etc for each country. The WiFi chips usually have an EEPROM to store various similar details and those will be intersected with the details from the regdb set by the system/user. The idea of regdb is to allow a roaming user’s machine to accomodate the settings of wifi while going to other countries than the base country. Regdb is presented in a signed binary form compiled from a text in a user readable form. One needs to modify the database in text format and then compile it together with the necessary keys. I will not explain this as it is better explained on wireless kernel pages. CRDA is the user space app that kernel uses to interrogate the regdb database. It is mandatory to be rebuild and installed together with the keys generated in the wireless-regdb build process. c. to set country CN in regulatory settings. Usually this is overwritten by the setting in the EEPROM of the WiFi card. One of the goals of this project is to run an Access point (AP) to which a client (STA) will connect and communicate. Scanning, association, sending, receiving data should work. One of quick solution for running an AP is hostapd package because it implements MLME in user space. One need to change hostapd to accept the negative channels we have just been added. We now need to connect a client (STA) to the AP so this is done on another Linux machine with the same changes done on the kernel and regulatory database. The above picture is for the 30dBm power limit. The next one is for the 20dBm and one with 10dBm transmit power. There is a visible difference between the three images, however probably a more precise measurement needs to be done. 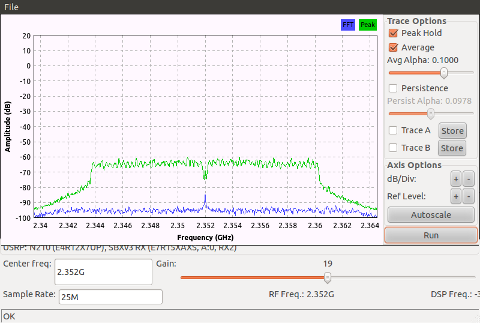 – it was possible to add 20 channels from 2312Mhz to 2407Mhz and the connection between similar wifi devices is possible. – there seems to be no difference in the transmit power for any channel between 2312Mhz (channel -19) to 2472Mhz (channel 13). – there is an increase of power level when changing above 20dBm although this needs to be checked with finer tools and also the thermal regime of the devices needs to be taken into consideration. – the same traffic speed is obtained for each channel compared with regular channels (1-14). 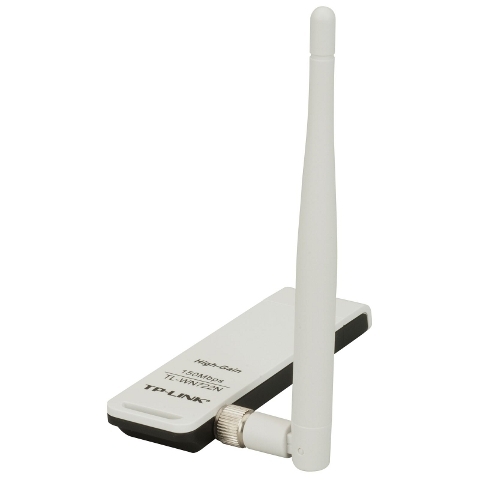 – to create a point-to-point link between two wifi devices using high gain antennas. An excel file calculating the theoretical results is here: Radio_Link_Budget_Calc.xls. i don’t know which compat-wireless version you have used but i did not have any luck with tl-wn722n that also defaults to CN regdomain. then i decided to skip channels thing and do the txpower boost only, backports compiled without problem and modified crda/wireless-regdb too. adapter detected running at 30dBm after reboot. but without effect. for check i used another router 2 km away that showed exact same signal strength from wn722n at 30, 20 or 16 dBm output power. when i started lowering the power below 16 then i noticed signal strength drop on the remote router too. one thing i did different in this test is i have not used patched hostapd, instead the device was running in client mode and generating test network beacons with mdk3 but i guess the txpower change should not be operating-mode specific?